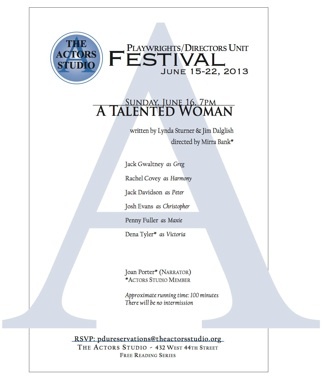 The Actors Studio liked A Talented Woman so much after their first reading of the play on May 20th, they included it in their "Best of..." Festival. The reading was on June 16th at The Actors Studio, NYC (432 W 44th St, Manhattan.) Lynda and I were thrilled by the direction and the performances.